You don't know Jack (in)!! Like the changing of the leaves, the birds' migration southward, and Taylor Swift winning a Grammy Award for chewing out her ex-boyfriends in song, so too as we looking at another Megaman Battle Network game, cranked out like clockwork from the factory at Capcom Headquarters in Japan. That being said, if Megaman Battle Network 3 turns out to be as good as the first two, then you've got another enjoyable hit in your hands. Mirroring its parent, the original Mega Man series, we see the return of the vile Dr. Wily, reviving the World Three (WWW) organization to help spread his own personal disdain of humanity. Back with a new plan, Wily seeks Alpha, an "alpha" version of the world's network that has been sealed off due to instability and, well, the capacity to destroy the Internet as they know it. Will he actually succeed in unlocking it? ...Yeah, and it doesn't go over well. Meanwhile, there's the N1 Grand Prix going on to determine who is the greatest NetBattler in the world! Will our hero, the ever-lazy Lan Hikari, and his trusty Navi, MegaMan.EXE, be able to win and earn himself a congratulatory maple-glazed e-ham? Similar to previous games, you spend a decent amount of your time controller Lan as he takes to quests and such in the "real world", talking to the colourful locals. But the real bread and I Can't Believe It's Not Butter of the game rears its head when Lan jacks into the Net and controls his online Navi, MegaMan.EXE. While exploring the Internet, he'll encounter numerous viruses that need to be promptly deleted via battles in 3x3 grid playing fields. Though he does have a handy Buster to shoot down his enemies, it really helps to have battle chips delivered to him by his operator. Battle chips have various properties, such as straightforward attacks, health renewals, and tricks to modify the playing field. You're only dealt a certain number of chips per turn, and they are randomly selected from your "folder", the list of 30 chips you want to use the most. Want more? Wait until another turn... As time goes by, you'll find better and better chips, synchronized with the amping difficulty of the game. Personally, I like the chips that summon other individuals' Navis the best. Who doesn't love having GutsMan drop from above and break the enemy's floor while delivering damage? That's Guts, Man. MegaMan.EXE is still doing what he does best: deletion. Also making their triumphant return are Style Changes and BugFrag collecting. Depending on how you fight in battles, you'll earn a new "Style" for MegaMan.EXE in time, which combines an element (making you resistant to it) and a new ability, such as improved fire power. I achieved my first style change at a very inconvenient time: right before the boss AquaMan, MegaMan learned a Fire Style, thus making that boss' attacks twice as damaging. Thanks, Capcom. As well, in a kind of Pokémon-esque manner, Battle Network 3 offers you the chance to tame viruses and gain valuable battle chips from them, provided you feed them tasty BugFrags, found mostly by counterattacking enemies at just the right times. 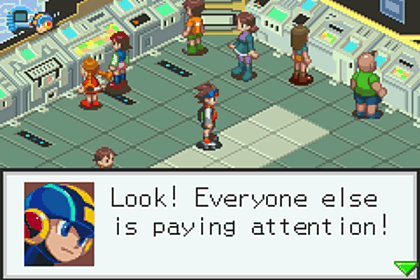 Battle Network 3 offers little that's new, but the things that ARE introduced add a bit of flair. Most notable is the inclusion of the Navi Customization program. 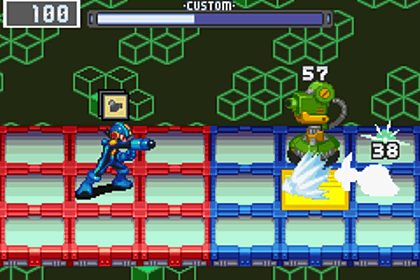 Instead of powering yourself up with specific items, the "NaviCust" (thanks, 8-character limit) allows you to add attributes to MegaMan.EXE by putting funky pieces into a grid like a Tetris battle — with some irritating limitations, of course. You can't have pieces of the same colour besiiiiiiide each other... you can't have pieces with a cross on it touching a certain liiiiiiine... you need a special add-on to turn pieces of each colourrrrrrrrr... So it IS like Tetris, if Tetris had a million silly rules and abilities such as twisting your block were sold as DLC. Now there's a version of Tetris that WOULDN'T sell. 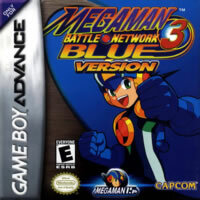 For the first time — which ended up starting an unfortunate trend — Megaman Battle Network 3 was released in two separate flavours: Blue and White. (In Japan, it was originally a stand-alone title but ended up being succeded by a Black version, which fixed the game's bugs and offered other updates.) Though both versions offer essentially the same game, there are a few minor differences, but nothing to make anyone legitimately want to rush out and buy both. There are Navis unique to each version (Blue has someone called "BowlMan" and a digital update of Punk from the Game Boy days, while White has "MistMan". ), and some chips vary. But if you're expecting to get a significant bang for your buck by obtaining both, think again. Did you like the first two Battle Network games? If so, you'll surely get a kick out of this one, as its similarities are beyond striking. I did find this one to be a bit more difficult than the first two, especially during the showdown with the final boss, so hopefully you've chuffed up your virus busting skills over the previous games. That said, I wouldn't play this immediately after the first two, as you'll suffer from severe burnout over the lack of innovation and the overarching "samey-ness". (And not just with the gameplay -- the amount of overlap in graphics is unfortunate but natural with sequels such as this.) Those eager to play this but lack a certain Game Boy Advance-labeled handheld can grab it on the Wii U Virtual Console. As for whether it's more novel to buy the White or the Blue version, just get the Blue one and call it a way. I think we can live without MistMan. He won't be "mist".